It's easy to customize this little Monkey Wrench baby quilt pattern to suit your needs. In the example, a variety of colorful fabrics are used to make the 'wrench' portion of each Monkey Wrench quilt block, but block backgrounds are all sewn with the same dark brown. Cornerstones repeat the dark brown, while sashing is assembled from a lighter golden-brown print. The outer border is lighter yet and sewn with a warm neutral fabric. Alter any of the baby quilt's fabrics to create a completely different look. Monkey Wrench Quilt Block Finished Size: 6" x 6"
Finished Quilt Size: 38" x 45"
You'll use ab easy quick piecing method to make four half-square triangle units (HST) for each Monkey Wrench block. Read the HST tutorial before you begin to determine if you would like to make units larger than required, and then cut back to the exact size. You'll also construct four -strip pieced units with double bars that are sewn between HSTs. Cut two 2-7/8" x 2-7/8" squares from one of your colorful fabrics and two dark brown squares of the same size. 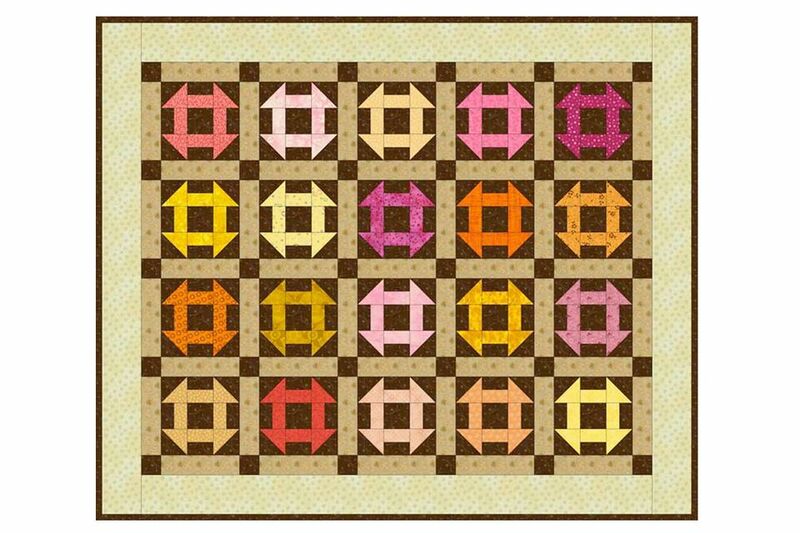 Pair contrasting squares and use the method linked above to sew them together to make four HSTs. Each HST should measure exactly 2-1/2" x 2-1/2". Square up one end of the strip set and then cut (4) 2-1/2" long segments from it. Cut a 2-1/2" x 2-1/2" square from brown fabric, for the center of quilt block (cut multiples squares from 2-1/2" wide strips cut from selvage to selvage. See How to Cut Patchwork Shapes). Arrange components into three rows as shown, lower left of illustration. Sew components in each row together. Press seam allowances towards the bar units. Join rows, butting seam intersections for a good match. Press. The Monkey Wrench quilt block should measure 6-1/2" x 6-1/2". If it's a bit off, refer to my article that explains how to square up quilt blocks. Make a total of 20 Monkey Wrench quilt blocks. Cut (2) 6-1/2" wide strips of sashing fabric from selvage to selvage; cut (2) more selvage width strips that are 2" wide. Square up one end of each 6-1/2" strip and then cut a total of (49) 2" wide bars (should be able to cut (42) 2" x 6-1/2" bars). Cut the remaining (7) 2" x 6-1/2" bars by cutting 6-1/2" segments from the narrower strips. Cut (1) 2" wide strip of brown cornerstone fabric from selvage to selvage; cut another strip that measures 2" x 20". Square up one end of each strip and then cut (3) 2" x 2" squares from the strips. Referring back to page 1, use a design wall or flat surface to arrange your quilt blocks into five rows, each with four blocks. Place vertical sashing between the individual blocks in rows and place horizontal sashing and cornerstones between the rows. Shuffle quilt blocks around until you are happy with the layout. Sometimes it's good to leave the room for awhile, and inspect the layout again when you return. Rearrange the blocks again if necessary before you begin to sew. Sew six horizontal sashing rows as shown, each with five cornerstones and four sashing bars. Match edges carefully before sewing. Press seam allowances towards the sashing. Sew vertical sashing bars between blocks in each row, and at the beginning and end of each row, matching edges exactly. Press seam allowances towards the sashing. Carefully join the rows, placing a horizontal sashing/cornerstone strip between them. Sew a sashing/cornerstone strip to the top of the quilt and another to the bottom. Press the quilt. Mark the top for quilting if necessary. Sandwich with batting and backing and quilt. Finish by applying the binding.